Ring my doorbell on any given summer day and I probably won't answer. Not because I don't want the company (I do) but because we probably won't hear the bell. Head around to the backyard though and you'll be sure to find us having a great time. Our backyard is our oasis in the summer, and our favorite place to be. Our backyard rules are simple - have fun and act like a kid (no matter how old you are). What I love most about spending time in the backyard in the summer is how easy it is to have fun - we don't need electronics or complicated toys to make the perfect backyard day. 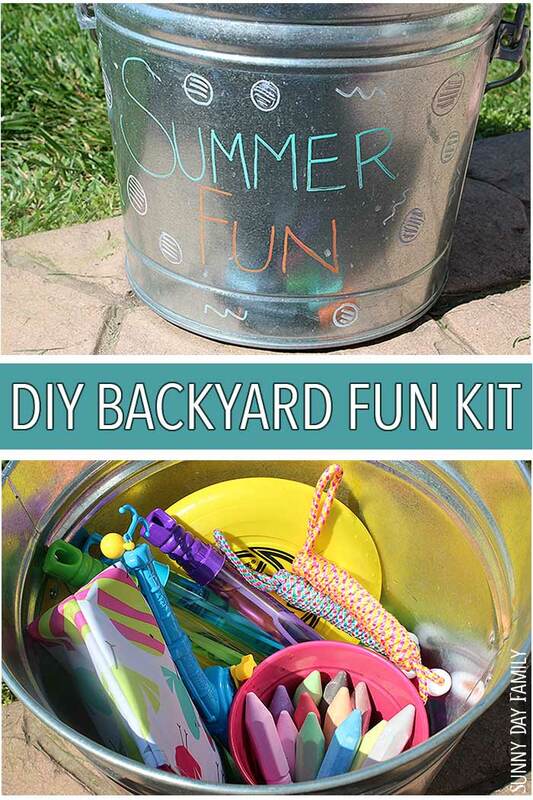 To make every backyard day a great day, I've put together a DIY Backyard Fun Kit packed with all our summer essentials. This kit is super easy to make and works great for a backyard party, a summer play date, or just a fun family day in the yard. I have everything you need to make one for yourself, plus a sweet way to top off your perfect backyard day. First, you need a container for all your backyard fun supplies. I use a galvanized metal bucket with a lid - it's perfect because it's durable and weather proof, with a secure top. But I like to make sure that it looks as fun on the outside as it is on the inside, so I did a simple DIY to liven it up a bit. 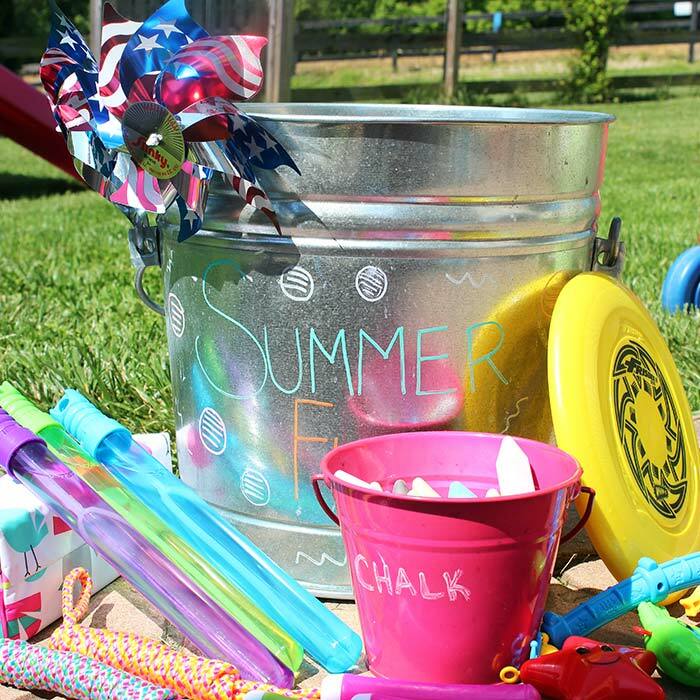 To make your own summer fun bucket, you need permanent chalk markers or paint markers. Make sure to not use washable markers or it will not be weather proof. 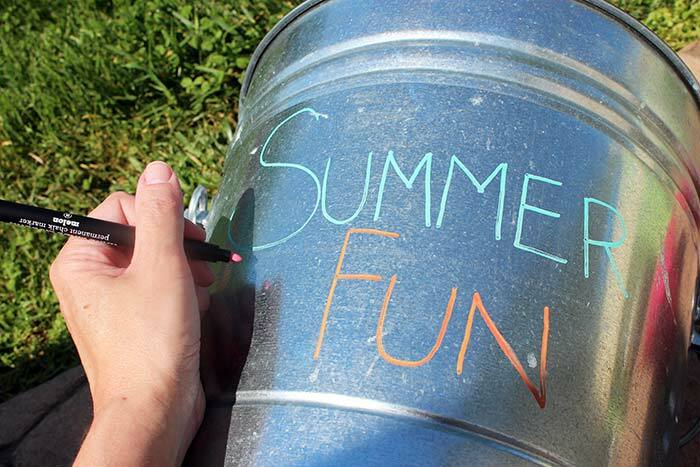 Use your markers to decorate your bucket with a summer theme. I wrote "Summer Fun" on ours and included a few decorative touches as well. 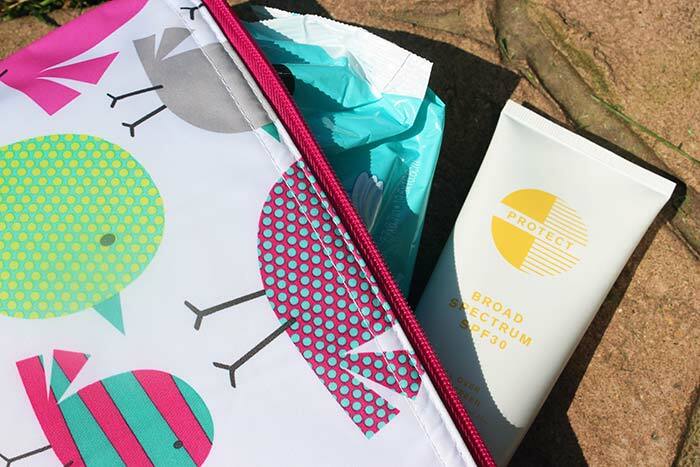 Allow to dry completely, then you are ready to fill your bucket with summer fun essentials! 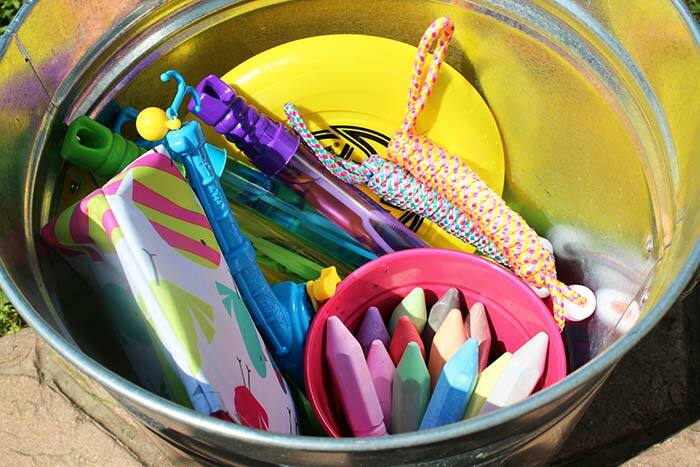 Add these to your decorated bucket, and be sure to include a small zippered pouch with your "mom essentials" - sunscreen, baby wipes, and hand sanitizer - those little things that you may need and won't want to run back into the house for. Once your bucket is filled, you're almost ready to spend the day in the backyard. 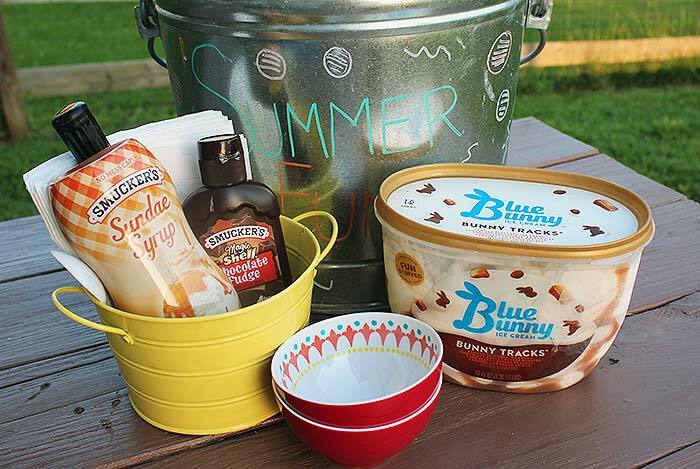 But we all know that its not a perfect day without a little summer treat, and one of our favorite ways to make our backyard days unforgettable is with Blue Bunny® Bunny Tracks® ice cream topped with Smucker's toppings! Ice Cream + Summer Fun = Better Together! When we're out playing in the backyard, the last thing we want to do is stop what we're doing and get in the car to go to the ice cream parlor. Making our own special treat of ice cream and toppings right in our backyard is the perfect way to keep our summer adventures going without missing a thing (and it's easier on my wallet too). I love to bring out the Blue Bunny Bunny Tracks, a few bowls, spoons, and napkins along with an assortment of Smucker's toppings to add delight (and my own creative touch) to dessert time. 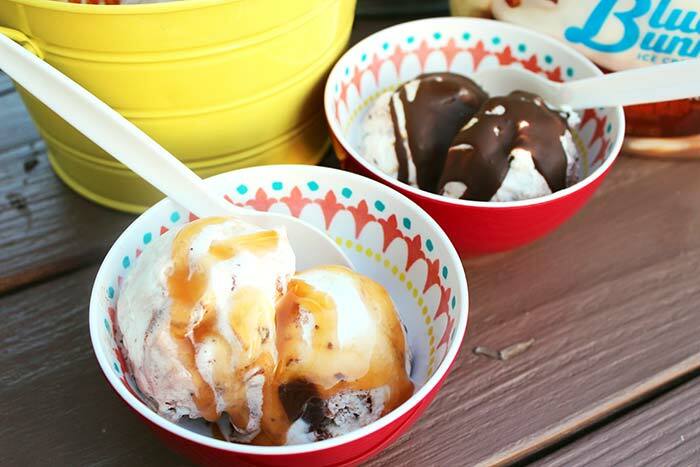 I'm a big fan of the Caramel Flavored Sundae Syrup while my husband and kids love the Magic Shell Chocolate Fudge Flavored Topping. You can please everyone in your crowd with these yummy and fun toppings! 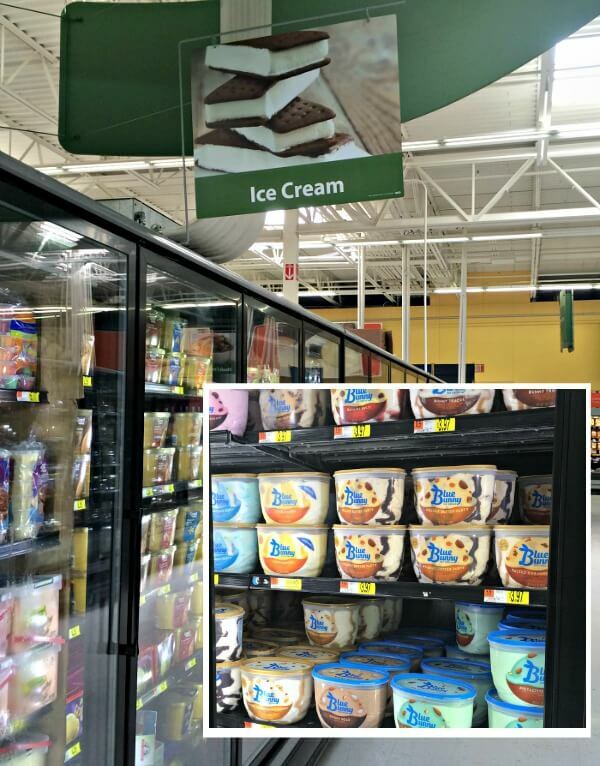 You can find everything you need for your DIY Backyard Fun Kit, including Blue Bunny ice cream and Smucker's toppings, in one trip to Walmart. 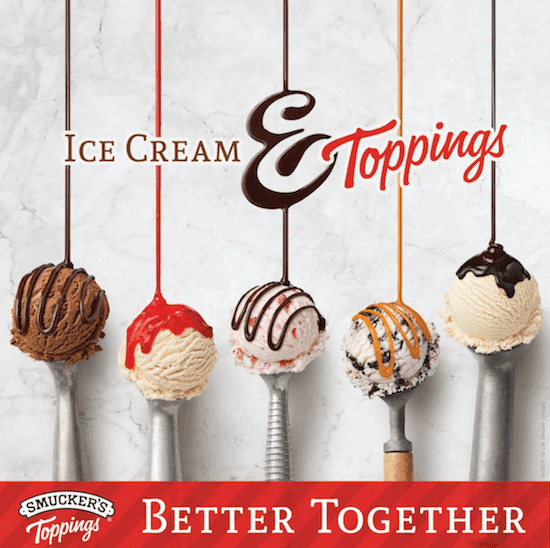 And, you can earn cash back on Smucker's Ice Cream Toppings with the free Ibotta app! How do you top off the perfect backyard day? 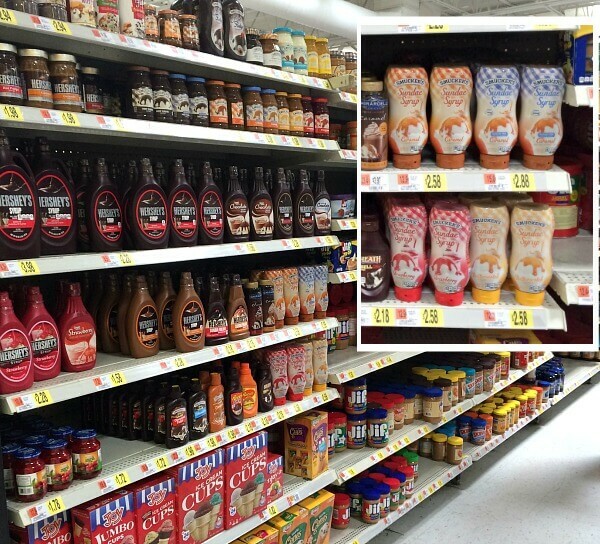 Check out these great ideas featuring Smucker's and Blue Bunny, and let me know your favorite in the comments below!